A thorough case history of past episodes, past treatment and medical or surgical interventions of your condition. A detailed physical examination including neurological, orthopaedic and chiropractic testing. X-rays, if necessary. 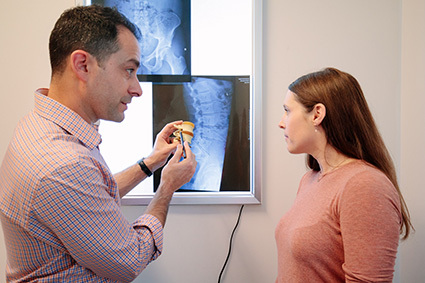 We offer on site X-rays, and understand the importance of standing spinal X-rays to see how your spine adapts when you are upright, providing more information than films taken when lying down. Adding to our high-tech analysis process, we provide modern adjusting tables with drop piece segments built in or Activator® instruments that are used for low-force adjustments. Your posture is the window to your spinal health. Poor posture indicates that the spinal tissues are strained, that the spine may be misaligned and could have abnormal function that leads to pain or further problems. We can evaluate your posture with a computerised analysis of digital photographs, assisting in the diagnosis process. In turn, this translates to better outcomes for you. We look forward to meeting you! Contact Floreat Chiropractic to book your first appointment.